"The future is unforeseen…do not leave to chance future happenings, but rather do all you can today to make your future be better." -Horace, the great Roman lyric poet, from his masterpiece Carpe Diem. Enjoy breakfast at Palazzo Margherita. Visit the Crypt of the Original Sin near Matera, also known as the Sistine Chapel of rupestrian art, along the ancient Appian Way. Witness its suggestive representation of scenes of the Old and New Testament, in a cycle of frescoes dating back to the 9th century. 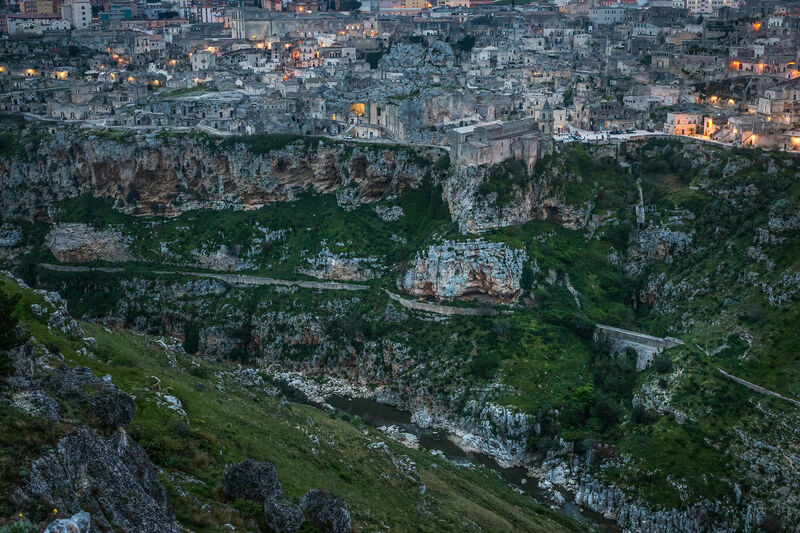 Take a guided tour of Matera and the Sassi, discovering its history and traditions. Eat a light lunch in Matera in a typical trattoria, sampling traditional local food. Enjoy free time for shopping and aperitivo. Return to Palazzo Margherita for a romantic candlelit dinner in our Salon (house wine included). If you are interested in visiting other important museums and rupestrian churches we recommend taking another 2 hours after lunch to explore on your own. You can visit the MUSMA (a European contemporary museum), the Palazzo Lanfranchi (a modern art museum), Casa Cava (a cave that has been restored into a unique auditorium), Casa Ortega (a unique arts & crafts school in the old home of the Spanish exiled painter), and a huge number of rock rupestrian churches. Take a guided tour of Tursi and its Rabatana, the most characteristic part of the historic center. Eat lunch in the old Arab town center of Tursi. Return to Palazzo for a cooking class, shaping traditional pasta and preparing sauce for your meal. Visit Grottaglie and its amazing ceramics district. Tour nearby Martina Franca and the Basilica of San Martino. Visit Bar Tripoli, known for its unique cookie/biscuit bocconotto and ice-cream affogato. Eat lunch at a local trattoria in the old town centre of Martina Franca. Enjoy the enchanting scenery and fantastic landscape of Valle d’Itria, the valley of the famous Trulli (cylindrical homes with cone roofs). Enjoy a welcome drink upon arrival at Palazzo Margherita. Tour the historical center of Bernalda, discovering ancient churches. Take part in a cooking class, offering guests the experience of preparing traditional pasta under the guidance of our chefs. Learn the techniques of shaping handmade pasta, assist in making a pasta sauce, and enjoy the taste of your own work. Class lasts approximately one hour. Enjoy dinner at Palazzo Margherita. Tour the Vulture area, passing by Parco Gallipoli Cognato, a precious treasure of biodiversity in Italy due to the richness of flora and fauna and spectacular birdwatching. Visit the ancient cellars carved into volcanic stone caves which were excavated by Franciscan monks in the 14th While there, enjoy wine tasting and a light lunch. Back at Palazzo Margherita, take a pizza lesson next to our wood oven, or simply relax and take advantage of our many amenities. Enjoy dinner in the Family Kitchen. Take a guided tour of Matera and the Sassi, discovering its history and traditions by visiting important museums including the MUSMA (a European contemporary museum), the Palazzo Lanfranchi (a modern art museum), Casa Cava (a cave that has been restored into a unique auditorium), Casa Ortega (a unique arts and crafts school in the old home of the Spanish exiled painter), and a huge number of rock rupestrian churches. Have lunch in Matera in a typical trattoria, sampling traditional local food. Back at Palazzo Margherita, spend time with our tailor who will share with you his collection of creations including shirts, ties, and scarves. Visit a fortified Masseria in the Val d'Agri (the heart of Basilicata). This Masseria is situated on the Agri River Valley where you can see Podolic cows, meaning that they only eat wild food without any extra chemical feeding. Here, you will experience and help to produce a typical mozzarella cheese called treccione or a Podolic ricotta cheese. Eat lunch at the Masseria. Enjoy dinner at Palazzo Margherita or a special candlelit dinner outside the Masseria (summer months only). Tour Martina Franca with its Baroque centre and visit Bar Tripoli, known for its famous cookie/biscuit bocconotto and ice-cream affogato. Enjoy the enchanting scenery and fantastic landscape of Valle d’Itria, the valley of the well known Trulli (cylindrical homes with cone roofs). Visit Locorotondo, one of Puglia's prettiest towns with a proudly conserved, easily walkable center and a calm, laid-back atmosphere. Eat lunch at a famous trattoria in the old town centre of Locorotondo. On the way back to Bernalda, visit the ancient arts & crafts shops and ceramics showrooms in Grottaglie. Enjoy a light welcome lunch upon arrival at Palazzo Margherita. Tour the Vulture area, passing by the Parco Regionale Gallipoli Cognato, a precious treasure of biodiversity in Italy due to its richness of flora and fauna and its spectacular birdwatching. Tour of the ancient wine cellars carved into volcanic stone caves which were excavated by the Franciscan monks of the 14th While there, enjoy wine tasting and a light lunch. Tour the Melfi Castle, Monticchio Lake with the Abbey, and Lagopesole. Back at Palazzo Margherita, enjoy dinner in the Family Kitchen. Take a trip through the Matera plateau to discover the rock civilization secrets and its wildlife heritage. Take a guided walk in the Park of the Rupestrian Churches where there are prehistoric caves, rupestrian monastic settlements, and prehistoric settlements. The flora of the Murgia National Park includes 1,200 botanical species, or about one sixth of the national flora of Italy and one third of that region, which is a remarkable number for an area of that size. Eat a picnic lunch in the Park of the Rupestrian Churches with traditional local food prepared by our chefs. Return to Palazzo Margherita to enjoy dinner. Depart for the beach and be welcomed with a drink and fresh fruit upon arrival. Eat lunch on the beach (we can prepare a picnic lunch or you can decide to dine there, experiencing a lunch with fresh fish of the day). Return to Palazzo Margherita, stopping along the way to see the ancient Greek ruins, Tavole Palatine, in Metapontum. Take part in a cooking class that offers guests the experience of preparing traditional pasta under the guidance of our chefs. Learn the techniques of shaping handmade pasta and making a pasta sauce, followed by the enjoyment of tasting your own work. Class lasts approximately one hour. Go Nordic walking in Pollino National Park among peaceful natural surroundings. The park is extremely rich with monuments and archaeological remains - ruins of ancient buildings, castles, fortresses, convents, monasteries, sanctuaries, churches, and chapels. Eat a picnic lunch with traditional local food prepared by our chef. Take an exciting rafting excursion into the gorge of the Lao River in Pollino National Park. The route is easy and fun for everyone, lasting approximately 1 hour. Eat lunch in a traditional restaurant in Lecce. Visit Otranto, located on the east coast of the Salento peninsula, featuring beautiful sandy beaches and the Aragonese Castle.